A word processor is a program used to type documents. Documents can be saved, closed and the opened again to continue working on them. The keyboard of a word processor is similar to that of a typewriter, but its capabilities extend far beyond the typewriter's. For example, you don't have to press the Return or Enter key at the end of every line - in word processing, the line "wraps around" when it reaches the margin you've set and allows you to continue typing without stopping, you only press Enter (or Return) when you want to start a new paragraph or insert blank lines. If you make a mistake while typing use backspace or delete to erase it. , and others. 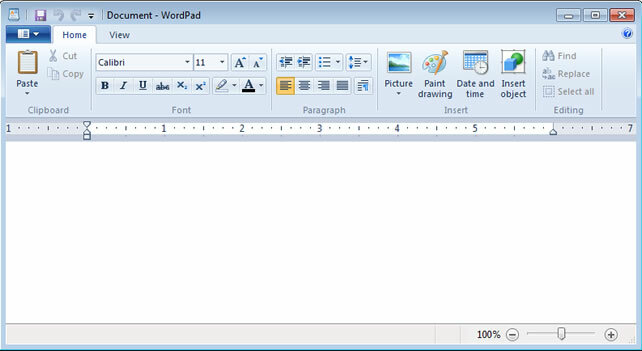 Windows comes with WordPad to edit and format documents and NotePad to edit text. Mac OS X comes with TextEdit or SimpleText. Open Office is an Open Source office application that can be downloaded for free at openoffice.org. Editing functions such as inserting, deleting, moving, and copying characters, words, lines, and even blocks of text are fast and easy with only a few keystrokes. Advanced programs will number pages, repeat material in the same place on every page automatically, and check the spelling of every word in your document. You print your document only after it looks exactly the way you want it to. Finally, copies of your documents can be stored on a disk, enabling you to retrieve, edit, and print them at any time. The text appears at the cursor. Use the space bar to place spaces between words. Use backspace to erase to the left of the cursor and delete to erase to the right of the cursor. Use Enter (or Return) to move the cursor down a line. Word processors allows you to type your text in Bold, Italics or Underline. This is useful when you wish to highlight some word or line in a document. To activate Bold, Italics or Underline click the icon button on the Toolbar, type the text that you wish to have highlighted then press Toolbar icon again when you are finished. The indicator on the Toolbar will appear highlighted as long as the highlight style is on. The text can also be modified by changing the Font. A font is the shape and size of a character of text. The three main types are serif (with tails); sans-serif (without tails); and script (similar to handwriting). Text colours can also be changed. Text can also be indented and tab settings added which modify where the text is placed on the page. Rather than press the space bar more than once set tabs where you want the cursor to move to. The page can be modified by changing the margins, adding headers or footers (repeating text on each page), page numbering, graphic images and various other ways. The Insert key toggles between Insert and Typeover. Sometimes an indicator on the bottom of the screen will display the typing mode you are in. Normally, any text after the cursor will be pushed across the screen (inserted) as new characters are typed in. With Typeover on the new character will just replace the old character at the cursor. Editing text is quite easy once you get used to it. Select text that you want to modify with the mouse or by holding down Shift and using the arrow keys. Holding Control (CTRL) will select text one word at a time. Once you have the text selected use Cut (Ctrl-X) to cut the text off the page and into a clipboard. Use Copy (Ctrl-C) to transfer a copy of the selected text to the clipboard. Use Paste (Ctrl-V) to paste the text into the document at the cursor. The Windows clipboard will only hold a single selection of text which is replaced with each new cut or copy. If you make a mistake most modern programs have an Undo feature (Crtl-Z). Many also have a Redo feature.